Ootheca: Containing on average 16 eggs with a 6-12 week incubation before hatching. Nymphs: 7-10 moults taking between 6-18 months to reach maturity. Adults: Live on average for 6 months. Can be distinguished from nymphal stages by the presence of wings in the males and wing stubs in the females. 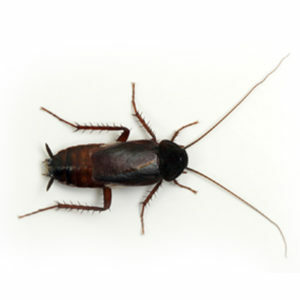 A large cockroach, 20-24mm long when adult. A reddish brown to black in colour. Nymphs are similar in appearance to adults with the exception of wings or wing stubs. Males can be distinguished from females when adult by the presence of wings which do not cover the terminal segments of the abdomen. Females will produce on average five ootheca, which harden to a dark brown with clear depressions on the dorsal surface. Primarily nocturnal pest, B.orientalis prefers a moist environment with a temperature range between 20-29°C. It can survive outside in Britain although breeding will cease when temperatures drop below 10°C. Consequently it has become a common pest of basements and cellars, as well as often being found in association with toilets, behind baths and sinks, where large numbers will congregate around sources of water. Faecal smears in conjunction with a distinctive odour are both clear indicators of an infestation. Closer examination of likely harbourages should reveal large numbers of B.orientalis grouped together. Stingray, Cimetrol, Victor Gel, Nylar 4 EW, Cytrol Forte. 1. The British Pest Management Manual. Section 5, pg 60. 3. Lab notes, Tarakan International.